The Indian Navy is continuing to move from one mishap to another as a major fire broke out in Russian-built quarter century old diesel-electric submarine INS Sindhuratna on February 26 morning about a hundred nautical miles from Mumbai – the tenth accident involving the IN assets and the third involving a submarine. The navy lost two young officers, Lieutenant Commander Kapish Muwal and Lieutenant Manoranjan Kumar, who were choked to death, while 29 other sailors and technical staff, including the commander, and were injured in the mishap. The Sindhuratna mishap triggered unprecedented fallout as hours later the Indian Naval chief Admiral Devendra Kumar Joshi resigned owning up moral responsibility for the spate of accidents. The Indian Ministry of Defence showed an uncanny haste in accepting Joshi’s resignation indicating that he might have been nudged by the ministry to put in his papers. For his part, Defence Minister AK Antony asserted that he had consulted ‘everybody’, including Prime Minister Manmohan Singh, before accepting Joshi’s resignation. Joshi is the first Indian military head to have resigned for an act for which he was not directly responsible. He still had 15 months to go before his superannuation. Eastern Naval Commander Vice Admiral Anil Chopra is believed to be the frontrunner to succeed Joshi as the navy chief and his chances are said to be brighter than Acting Navy Chief Vice Admiral Robin Dhowan. Sindhuratna was the fifth in the series of ten Kilo-class submarines bought from the Soviet Union/Russia between 1985 and 2000. The ageing boat was commissioned in November 1988 in Russia’s Nizhny Novogorod and underwent a refit at the naval dockyard in Mumbai for six months ending December 2013 in keeping with India’s recent thrust on self-reliance. There is a distinct takeaway for the Russians in the Sindhuratna episode which has uncanny similarities with the INS Sindhurakshak accident on August 14, 2013 midnight. 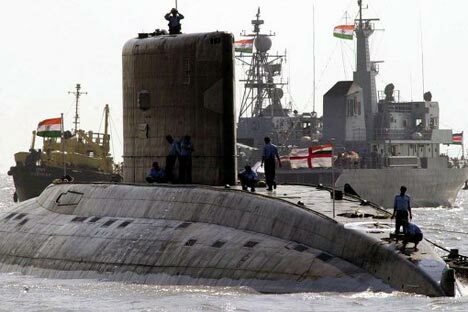 Both the subs were Russian-built and were being prepared for deployment after undergoing intensive retro-fitting – Sindhuratna locally while Sindhurakshak in Russia. Sindhurakshak was docked in the Mumbai naval dockyard at the time of the accident, while Sindhuratna was a hundred nautical miles from the Mumbai coast; but both the boats were within the jurisdiction and operational control of the western naval command. In both the cases, the mishap was triggered in the battery pit because of the leaking batteries. But unlike the Sindhurakshak, the Sindhuratna was not armed with lethal missiles and torpedoes as the Indian Navy personnel were checking INS Sindhuratna for sea-worthiness after the refit. This is what prevented a much bigger disaster as eighty personnel were onboard when thick smoke started bellowing out from Sindhuratna. In the case of Sindhurakshak, fire reached the missiles and torpedoes section, triggering a series of explosions which eventually sank and destroyed the submarine. INS Sindhurakshak is still lying at the sea floor and an expensive salvage operation is still being planned. The latest mishap involving INS Sindhuratna may well favour the Russians as it exposes the technical frailties of the Indian Navy and puts a laser beam focus on the ineptitude of the Indian Navy. The Russians had promptly offered to help in the Sindhurakshak accident investigations, but India has not availed of this offer and kept the Russians out of the probe.